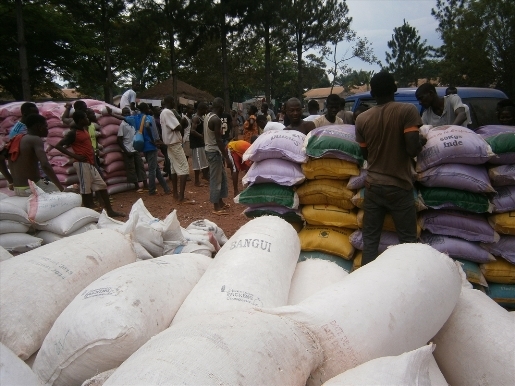 Oxfam says half the 4.8 million population of the Central African Republic needs humanitarian assistance. Around 80 donors, meeting in Brussels on 17 November, pledged the sum over three years. Djotodia took control of a transitional government, but lost control of Séléka soldiers, who engaged in widespread killing of civilians, burning and looting of homes, and other serious crimes in which Christians were specifically targeted, while Muslims and mosques were largely spared. Human-rights watchdog groups reported that Séléka militants had killed hundreds of people and driven tens of thousands from their homes. Djotodia formally disbanded Séléka in September 2013, but rebel violence continued and throughout 2013 was increasingly met by the rise of self-defense forces, called Anti-Balaka (“Anti-Machete”). The African Union, European Union, and France deployed in and around Bangui. Fearing “genocidal interfaith civil war”, in October the leaders of the country’s 4 million Christians issued a joint statement declaring the military assistance “ineffective”, and called for a more robust international response. The United Nations sent a peacekeeping force in April 2014 and in September the U.N. Multidimensional Integrated Stabilization Mission in the Central African Republic had assumed command over the regional military units, a 10,000-soldier force. Djotodia resigned in January 2014, replaced by the Parliament-appointed Catherine Samba Panza as interim president. Anti-Balaka continued a revenge campaign of ethnic cleansing in western CAR, forcing Séléka to retreat to the northeast. Many hundreds of Muslims, as well as non-Muslims, were killed, and tens of thousands fled. In July 2014, the armed groups signed a peace agreement in Brazzavile, the capital of the neighbouring Republic of the Congo. Fighting now is mostly “within and between the militias for land and resource control”, the U.S. Commission on International Religious Freedom said in its 2015 Annual Report. The country is largely partitioned between Christian and Muslim populations; Anti-Balaka continue to dominate the south and west, while Séléka elements dominate the north and east. The CAR remains unstable. Violence is almost daily, particularly in the northern and north-eastern regions, which are still under the control of armed groups. One recent outbreak of violence in Bria, 400km northeast the capital, Bangui, reportedly claimed up to 85 lives. Last month, 37 people were killed during an attack on a refugee camp in Kaga Bandoro – in the remote north. Three of the country’s topmost religious leaders, Rev. 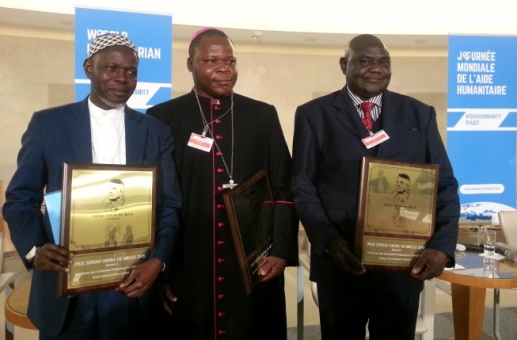 Nicolas Guérékoyamé-Gbangou, the President of the Evangelical Alliance; Imam Oumar Kobine Layama, President of the Islamic Community; and Mgr. Dieudonné Nzapalainga, the Archbishop of Bangui, were among the CAR delegation in Brussels. In the midst of three years of violence, often portrayed as a religious conflict, the clerics formed a joint ‘platform’ to promote peaceful coexistence between Christians and Muslims. Their message: violence in CAR is not primarily a religious conflict; instead, the root of the conflict lies in the struggle for political power. Imam Oumar Kobine Layama, Msgr. Dieudonné Nzapalainga and Rev. Nicolas Guérékoyamé-Gbangou received the 2015 Sergio Vieira de Mello Prize for their peace-keeping efforts. Rev. Guerekoyamé-Gbangou welcomed the commitment of donors. “The international community has listened to the people of the Central African Republic by promising this package for the next three years in order to help us raise our heads,” he said. “Goodwill gestures on the part of my compatriots are necessary: efficient and effective actions of the authorities through dynamic socio-economic structures, etc. The Archbishop of Bangui, recently raised to the rank of cardinal by Pope Francis for his commitment to peace in the Central African Republic, also called for a good response from Central Africans. Ahead of the meeting in Brussels, UK-based charity Oxfam warned that “the people of Central African Republic cannot face another year of the present dire situation which has left half of the 4.8 million population in need of humanitarian assistance. Oxfam said the latest donor meeting has the potential to be an important step in restoring peace and security, and reviving the economy, but that donors need to show both a long-term commitment and provide flexible funding. The World Bank has pledged $500 million over the next three years. It says it will “support public finances management, reintegration of former combatants and displaced population and job creation through a large road reopening and the relaunch of the agriculture sector”.